We had a lot of fun though! I only wish my apartment was bigger it is absolutely not suited for guests. I'm kinda relieved I am going back to Berlin next month. However, we started by making a huuuge grocery shopping morning and carried it all downhill we were so beat when we arrived because we bought just so much stuff, drinks and all. (I never buy drinks or bottles, they're just too heavy! 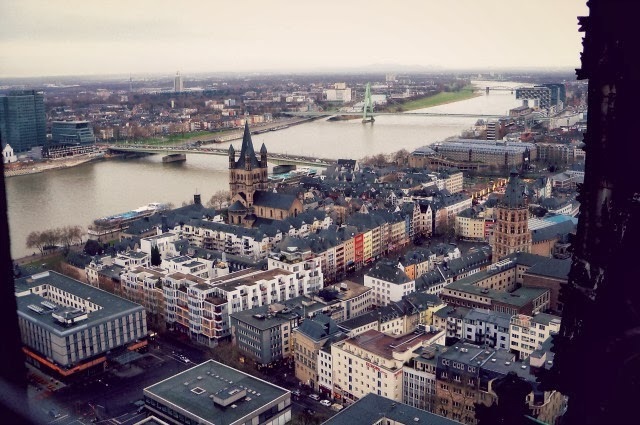 I actually live on tea and tap water and instant coffee only xD ) The Friday when we arrived I showed her through Bonn, we made a little shopping trip, I showed her my university and the Rhein river and all that and the beautiful little oldtown. We went home early and made Spaghetti Bolognese and watched the first Hunger Games movie (because she hadn't seen it yet) and went to bed almost early. 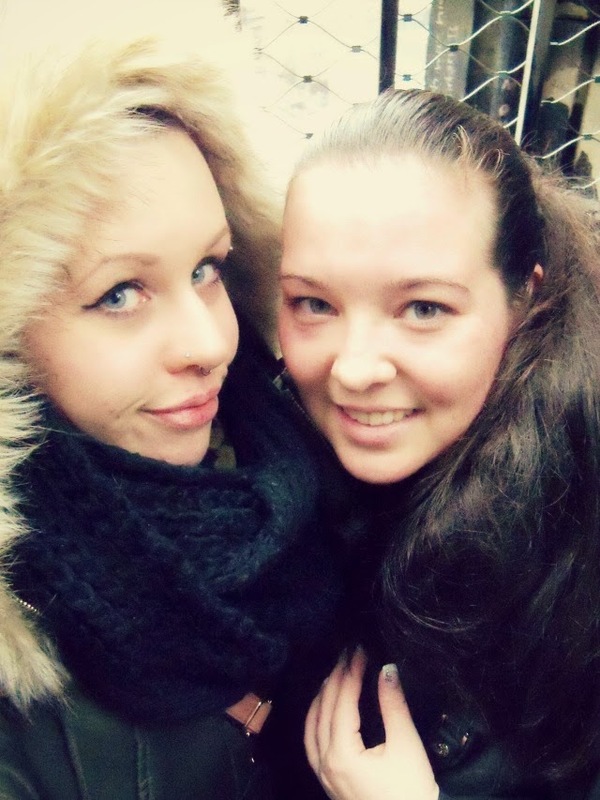 Next day we went to Cologne! We visited the Cologne Dome and went on top of the dome. Oh my. We really wanted to. It's more than 500 steps until the top and let me tell you, 500 steps is a LOT. We were already sweating after maybe 50 steps xD My cousin panicked in the end a bit because there was a different type of stairs where you could see the bottom still and yeah, that was kinda creepy, even for me who has absolutely no problem with height. We made it to the top somehow and a nice father even gave me a chocolate bar as a gif for making it to the top xD We were really unlucky with the weather though it was really windy, rainy and cold, freeezing cold on top of that dome. We were so proud we made it though! We made it to the top, yeeaah! 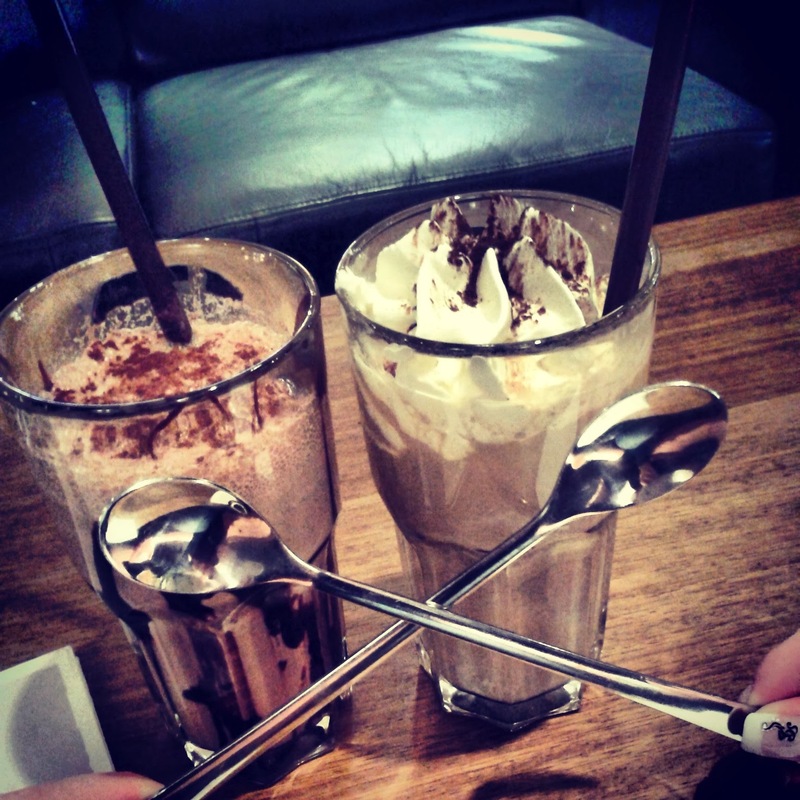 Ice chocolate and ice coffee! My throat was hurting so bad I drank mine in like 5 minutes wish I could have enjoyed it more :'( Maybe next time! The café was really nice it had a lot of nice waffles, ice drinks etc. We also splurged on some burgers and beer on the way back home it was sooooo good. I think we both slept like little babies because we were just done. On Sunday we only grabbed some coffee and went to the cinema which was really nice, nachos with cheese! (Not the best choice if you have a throat infection but I loooove cheese nachos so much...and it's not like I'm going to the cinema often..) On Monday she left and we didn't do anything; I just went to the doctor at 8AM in the morning because I was feeling worse every day and we sat in a café until she went to the airport again.